A boomtown can be simply defined as a community undergoing rapid growth due to sudden economic shock. There is a long history of U.S. boomtowns linked to natural resource development dating back to the 1849 gold rush, which sparked a massive population migration to California. As a result of the increased population, mining towns appeared throughout the region to support the gold rush development. San Francisco emerged as the primary supply center for the new activity and, until the 1920’s, quickly became the largest city west of the Mississippi. Today, many modern boomtowns in the United States are linked to the energy sector, which includes coal, oil, and natural gas. There are several characteristics researchers identify as an economic boom for a community. While often linked to a natural resource such as coal, oil, and natural gas, they include, but are not limited to, an increase in population, an increase in community and family wealth, and enhanced community economic performance. According to Cummings and Schulze (1978), “Boomtowns are characterized by a large jump in population over a 5 to 12 year construction period, after which the population settles to a lower level associated with the completed activities” (p. 374). The impact on community wealth generation is also well documented. For example, as a result of the recent oil and gas development in Ohio, it is estimated more than 600 Ohioans have become millionaires (Downing, 2013). Relating to the local economy, “multiple studies point to the stimulating role of natural resource extraction in economic performance” (Tsvetkova and Partridge, 2015). Many of the characteristics that produce boomtowns are influenced by sudden economic shocks associated with oil and gas development. Researchers have identified four stages to summarize the oil and gas development process (see image 1 below). According to Kelsey, Partridge, and White (2016), the stages include “(1) initial exploration/land acquisition; (2) drilling and construction of supporting infrastructure; (3) drilling and filling in supporting supply chain; (4) mature stage of production” (p. 14). 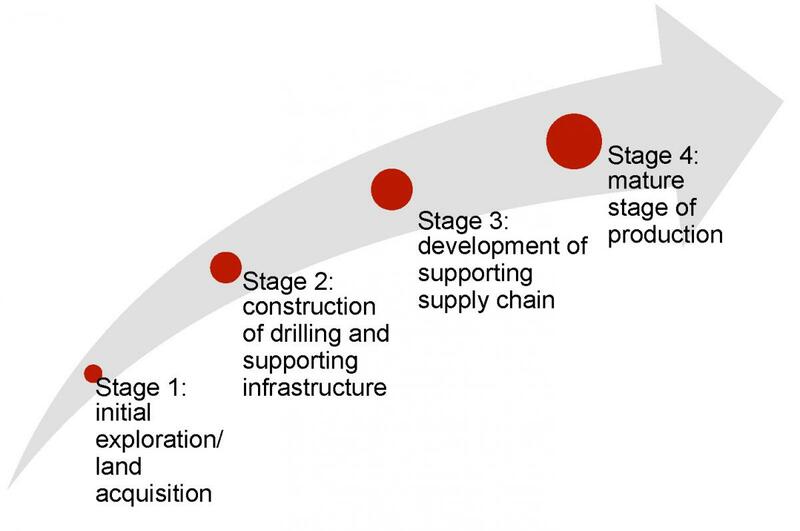 Many of the boomtown characteristics align with the core development stages in oil and gas development, as depicted in image 1. In stage one, initial exploration/land acquisition, communities and landowners typically experience an increase in activities related to property sales, lease agreements, and mineral rights contracts. This enhances community and family wealth associated with boomtowns. In stage two, communities experience an increase in construction activities related to drilling and pipeline infrastructure. During this stage communities will see an increase in population and enhanced economic activity. For example, a Pennsylvania study indicated that the drilling and infrastructure development phases account for 80 percent of oil and gas employment (Brundage, et al. 2011). As noted above, the increase in population to support short-term construction activity is a common characteristic found in boomtowns. In stage three, communities experience additional investments in supportive supply chains and midstream development such as natural gas processing facilities. In stage four, the mature stage of production, new construction has slowed leading to a regression in the migratory workforce. Rather than new construction jobs, economic activity is now based on operations and maintenance jobs, as well as royalty payments connected to oil and gas production. A sudden increase in population, wealth and economic activity due to a sudden shock can create a boomtown scenario for communities. While there have been numerous types of economic shocks to trigger boomtowns (e.g. gold, silver, copper, technology), many modern day boomtowns are related to oil and gas development. While economic shocks contributing to a boomtown are well documented, every community will respond differently. Historical data indicate there is a beginning and an end to an economic boom for communities. Fact sheet 3, “Contributing Factors to a Boomtown Bust,” will describe characteristics that influence the length of the boomtown cycle. Brundage, T.L., J. Jacquet, T.W. Kelsey, J.R. Ladlee, J. Lobdell, J.F. Lorson, L.L. Michael, and T.B. Murphy. 2011. Pennsylvania Statewide Marcellus Shale Workforce Needs. Williamsport, PA: Marcellus Shale Education and Training Center. Cummings, R.G., Schulze, W., 1978, Optimal Investment Strategy for Boomtowns: a theoretical analysis, American Economic Review, 68(3): 374-385. June Professor of Economics, University of New Mexico.